Running is something that makes me happy. I never feel more free, more joyful, than when I’m running through a beautiful landscape. It’s probably the main reason I love trail running. 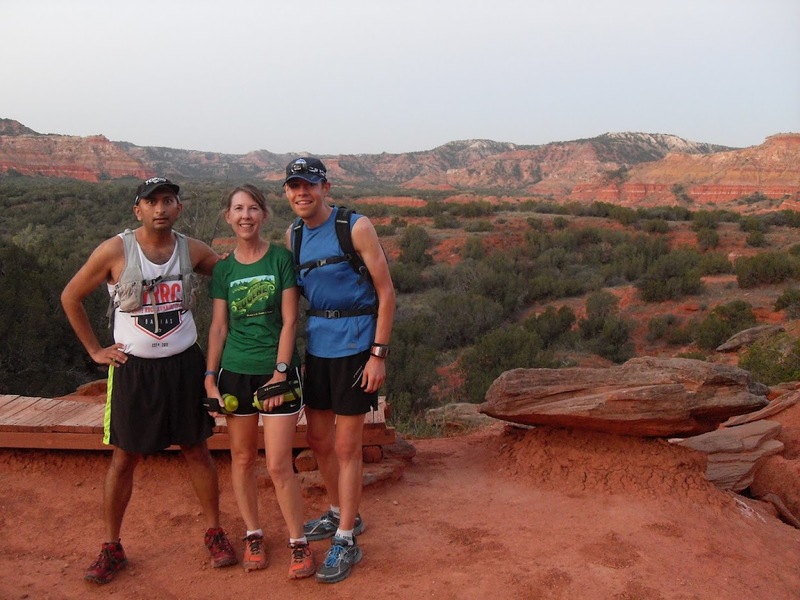 I recently ran in my first trail race, the Palo Duro Trail Run. It was also my longest distance to date, 50 kilometers (31.1 miles). I enjoyed the experience tremendously and loved running in the desert, even though it meant seven and a half hours of running and 95 degree heat at the finish. That’s Texas in October for you. Trail races are very different from marathons. You have to bring a lot more gear. I always compare trail running to a small military operation. Carrying all our gear to the bag drop before the start of the race. It was 38 degrees at the start under a clear sky filled with stars. 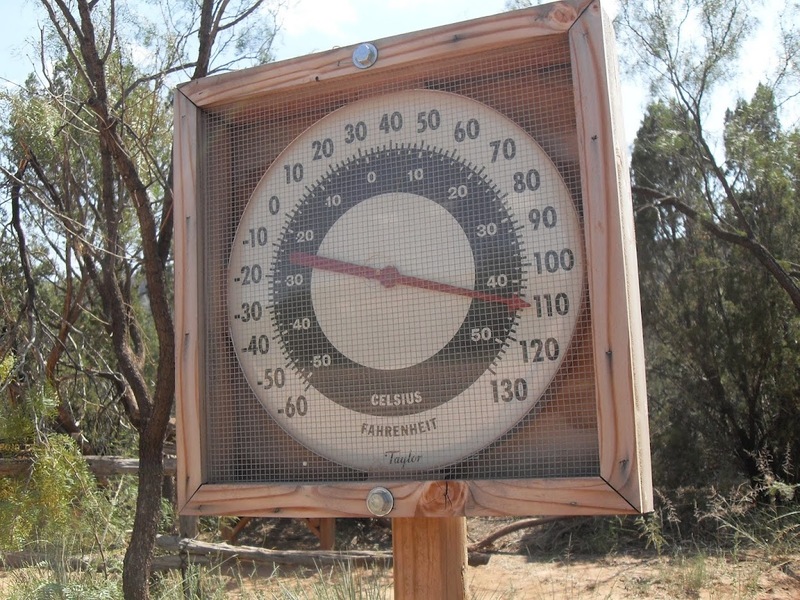 By 5:00pm the temperature would rise to 108 degrees. Bagpipes played as people prepared for the 50K start at 7:00am. Away from the lights of the start area it was pitch dark. Headlamps were used for the first 45 minutes of the race. What you run in is important. Skirts are always a comfy, cool alternative to shorts. Even for men. Almost everyone carries their own water, either in their hand . . .
. . . or on their back. You learn to eat on the go. It takes a lot of energy to run 20K, 50K or 50 miles, and the aid station tables are loaded with lots of goodies. Some runners are able to resist the temptations of the aid stations and run straight through. The early morning sun coats the canyon and those lucky enough to run there in a beautiful golden glow. Even the parking lots are scenic. The sky was a brilliant blue the entire day, with not a wisp of a cloud anywhere to be found. 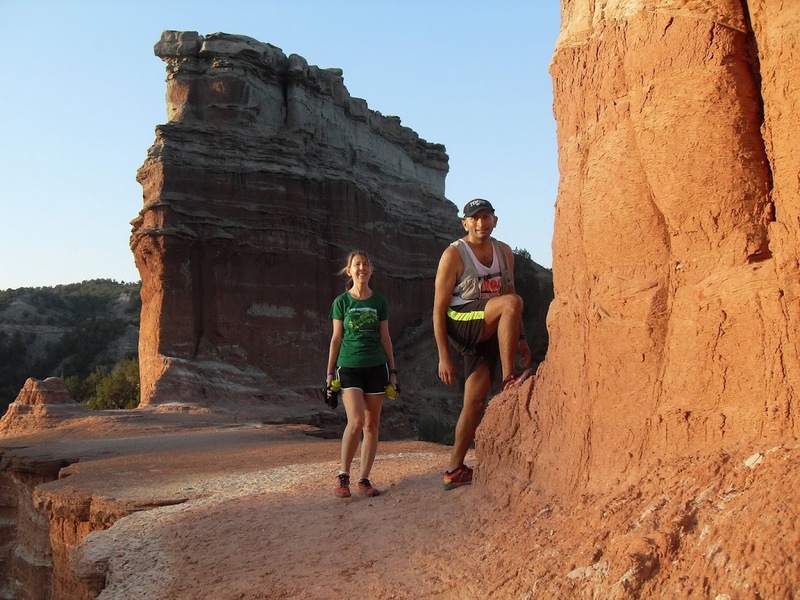 There are man-made treacheries that need to be carefully navigated in trail races. These stairs were never fun, but especially not on the final loop. 50K runners went down the stairs three times, 50M runners four total. Muscles tighten and protest in the harsh terrain. Sometimes it’s necessary to stop and stretch. Trail running can be a solitary endeavor, but at times small trains of runners would come together and infuse the trail with conversation. My training partner, Hari, leads the way, with me following. A lot of times walking up a steep hill is actually faster than running. By the third loop I enjoyed every opportunity to walk, even if it was uphill. Hari leads us up the hill. People run ridiculously long distances for a multitude of reasons. Some to challenge themselves, some to fight their demons, and others to remember someone they loved. Some of the fastest runners stay so focused they barely register anything around them. Others make it look much easier than it really is. Nothing means more to a runner than seeing the finish line–except maybe having their husband waiting there for them. All photos taken by my awesome boyfriend, Michael Friedhoff, who spent the entire day lugging heavy camera equipment up and down the course. He fell asleep before I did that night. Why are wild places so vital to our existence? I’ve pondered this question since my first trip years ago to Yellowstone National Park, and wrote a photographic post about the subject last year. Most people may not think of a national park as being “wild,” but I assure you, once you step off the main road or the shorter, more visited hiking trails and enter the back country, you are indeed in a wild place. Sometimes you’re lucky enough to experience it directly from the main road, such as when coming across a pack of wolves circling a group of elk cows and their calves, like I did one summer, or when you spot a grizzly bear at dusk, just off the road, pawing grubs at the base of a decomposing tree trunk. Man’s presence is not needed for the wild to flourish, but I’m convinced we need wild places in order to flourish as human beings. We’re not separate from nature, we’re just another part of it. Wild places strip us of our modern contrivances and remind us how simple and present life really is. For the first time I truly understood what a privilege it is to be able to visit a wild place; a place that provides a space for animals as wild as grizzly bears to live. That just knowing that these places are there adds value to our lives, even if we don’t go there often. This was an epiphany; and silly as it sounds, I realized that I hadn’t really understood why wild spaces are so important until that moment. When I was still teaching fifth grade, I used to come back from our summer road trips to Montana and Wyoming feeling sad that most of my students had never experienced a wild place, and probably never would. I felt certain that if only I could pack them all into a bus bound for Yellowstone, get them on the trails, and let them spend time in the wild, it would change their lives. Children need to see that the earth is a living thing, that there are wild places with rules all their own, and that everything they think is important in life really isn’t. Once in Yellowstone we mistakenly took a left instead of a right and wound up taking an unplanned all day hike up Sepulcher Mountain. For almost an entire day we never saw another human. The weather was somewhat stormy, and I remembered all the warnings I had ever read about hiking in the mountains during lightning. There is something life-altering about spending an entire day in nature, having to be alert and attentive to the possibility of death from weather or wild animal, and yet feeling so completely alive because of it. We sat at the top and viewed the mountains around us. I had a profound feeling that I was at the center of the world, and that it didn’t matter what happened to the rest of the world, Yellowstone and the wilderness would always be there. It didn’t need us. It didn’t need me. Life would always continue, with or without man. There was still snow at the top, and because we were lightly dressed we ran down the side of the mountain in our hiking boots. It felt like we were flying. Missing that turn on the road turned out to be one of the best days of my life. I think back often on that day climbing Sepulcher Mountain. I can imagine the grizzly bears, the bison, and the wolves going on with their lives, oblivious to anything but survival. Life is harsh in the wild, but perhaps our own modern lives are just as harsh, if not more so, than anything we can imagine in the wild. Perhaps the need to connect with wildness is why I love trail running. When I’m running on a trail in a beautiful location, even if it’s only half an hour’s drive outside the city, I’m always cognizant of the possibility of danger. I don’t want to get chased down by a bobcat or trip over a rattlesnake, but running through a forest or desert canyon gives me a sense of freedom and being alive like nothing else does. So find someplace wild to visit. Spend time in the Needles in Canyonlands, or hike into the wilds of Alaska. Get out of the car. Walk. Make yourself a part of the natural world. Remind yourself that the entire world is your home. See what lessons wild places have to teach you. West Texas is flat. Really flat. And treeless. It’s easy to imagine thousands of buffalo roaming the plain, or tornadoes barreling across the horizon. Amidst all this flat emptiness, it’s tough to believe there’s a canyon anywhere close by. But there is a canyon, and it’s the second largest canyon in the country. 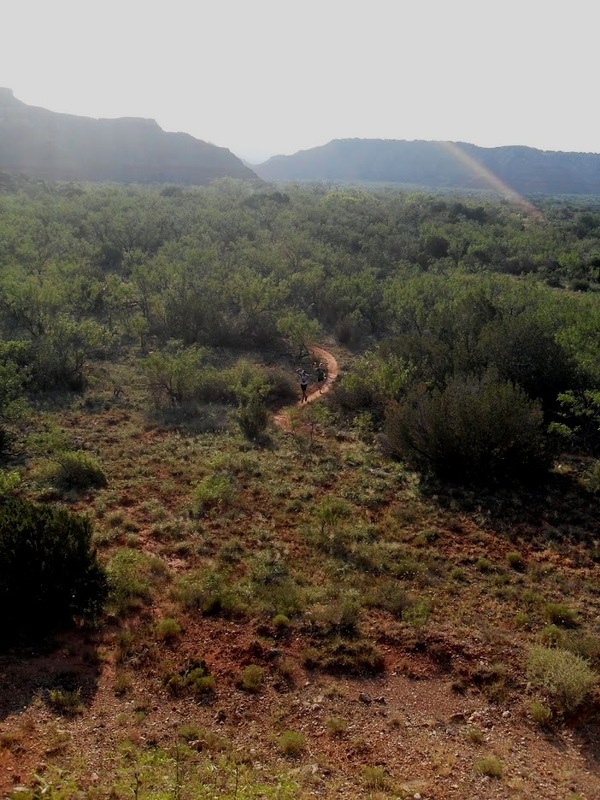 This past weekend some friends and I camped in Palo Duro Canyon in preparation for our trail race there in October. Some places in the country have snow drifts. In West Texas, we have mud. Flash flood warning signs are everywhere in the park. It’s obvious Palo Duro had a significant rain event in the canyon sometime before we got there. But it wasn’t as significant as the rain and flooding they had there in 1978. Though not deadly, spiders as big as your hand are nevertheless scary. There are tarantulas in the park. Supposedly they jump. Looking for evidence of other animals in the canyon is easy in the soft sand. Other than these raccoon tracks, we saw other evidence of deer, hogs, coyotes, and lizards. It was extremely hot during the day in the canyon. 114 degrees was the highest we saw. We had been hoping to have cooler temps, but at least it was cool in the mornings and evenings. Even Shasta felt the heat. To avoid the intense sun, we stayed under our shade shelter and played Uno, Monopoly, read, snacked, and played with the dogs. Hari is like the overindulgent grandparent when it comes to Shasta. Kurt braved the elements and went for a ride. One morning we got up before the sun and went for an eleven mile trail run on the Givens, Spicer & Lowry Running Trail. It was the best trail run I’ve ever been on. It was exhilarating to run through such amazing scenery. 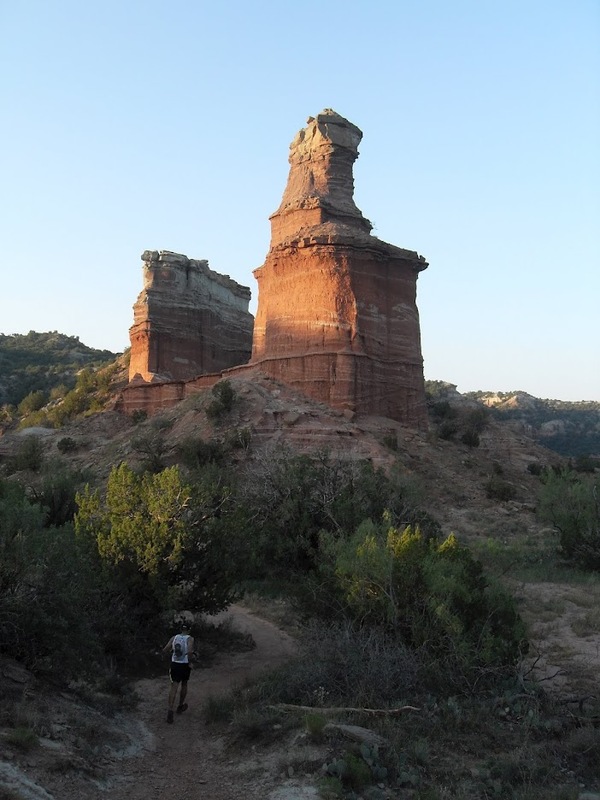 Our trail took us to the Lighthouse formation, which is an iconic Texas landmark. Hari and I took a break at the top of the Lighthouse. Kurt took photos. The trail winds through the canyon. We had it to ourselves for hours. We took the Little Fox Canyon Trail loop for a few extra miles. It was starting to get warm, but it was nothing like the humidity we’re used to running in. Tired, dusty, trail legs after a run are never pretty. Even Jay was impressed enough to take a photo. Our last morning, Kurt and I got up once again before the sun and took a short 3.5 mile hike on the Rojo Grande and Juniper Trails. I love the desert light in the early mornings. West Texas is a dangerous place. On the way back to Dallas, even stopping at a rest area (which also doubles as a tornado shelter) can be treacherous. It was a great trip. 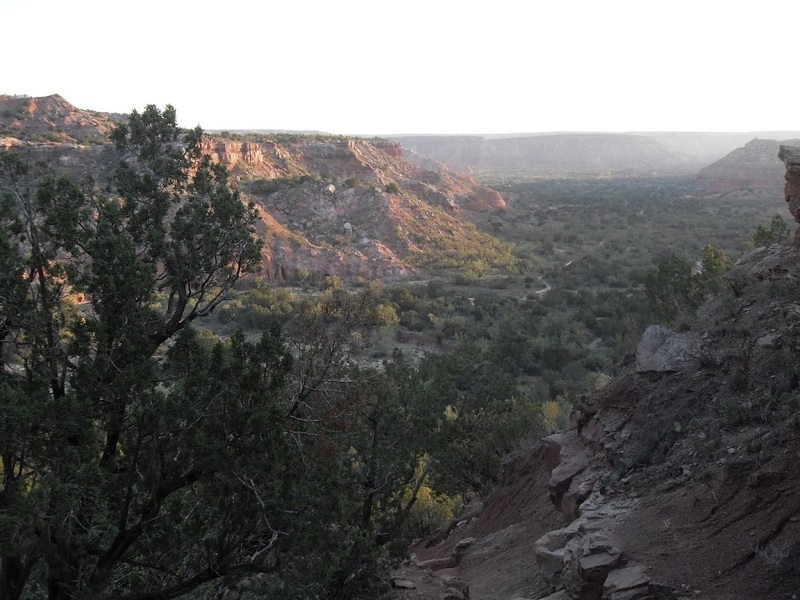 From the coyotes howling in the middle of the night, to the full moon rising over the ridge, to the turquoise blue collared lizard I thought was a bird, and the Milky Way and Big Dipper stretching across the night sky, Palo Duro Canyon is beautiful. And of course, everything is more fun with good friends. I can’t wait to go back in October for the trail race. Lighthouse trail run photos courtesy of Kurt Cimino. During our week of camping in the Tetons, followed by my daughter’s wedding, we were audience to the continually changing beauty of the Tetons. I wanted to post a few photos of the Tetons, to show how different they looked at various times of day, but rather than just “a few,” decided to post all of the best photos. After unzipping the tent each morning, the Tetons were always my first sight. It became a game each morning to discover how the mountains would look that first hour of the day. This was the view from our campsite. The afternoons were very warm, and the sunshine at altitude was intense. Everyone got sunburned the first day within the first hour. Each afternoon seemed to bring dramatic weather, with winds and dark clouds, though many times the rain never hit the ground. Rays of sunshine beaming down from the clouds. It never stayed cloudy for long. I love the way the cloud shadows danced across the mountains. The evenings were simply gorgeous. Each evening was different from the one before, depending on the clouds and colors. Our first night there, the Milky Way arced across the sky like a white rainbow. “NICE JACKET!” I was bent over my travel bag in the Portland Airport, putting away my raincoat from the train ride, and realized the loud voice was talking to me. I looked at my sleeve to see what I was wearing. My Boston Marathon jacket. The one I rarely wear because I don’t like to draw attention to myself. An older woman and her husband stood just behind me. I noticed he was wearing the black version with green stripes. “I like yours better,” I told him. She was probably ten years older than me and didn’t seem like a runner, especially one who had run Boston. She asked me what other races I had run, which one was my favorite, how fast I was, how many miles I logged each week, on and on and on. She was like an avalanche of questions and words, and I couldn’t catch my breath. She went on to say she hardly ran, she was slow, she wanted to run more, and did I live in Portland? I managed to tell her I had just run the Eugene half marathon and was flying home to Dallas. “Oh! SO ARE WE!” Her husband grinned and remained silent. He hadn’t said a word the entire time. I vowed not to sit next to them on the plane. I smiled at the talking woman and her husband as they passed on their way to the back of the plane. I wasn’t being rude; I just wanted to read my Kindle and maybe sleep a little on the plane. I needed some time to think about the past week, the race in Eugene, and the time spent with my daughter. I wouldn’t see her again until her wedding in July. There was a brief layover in Kansas City, and before we landed an announcement was made asking “the couple celebrating their thirty-seventh wedding anniversary” to please see one of the flight attendants before they left. Thirty-seven years of marriage? Impressive. When the plane landed, a flight attendant carried back a bottle of champagne to the couple celebrating their anniversary. Most of the people disembarked, and the passengers continuing on to Dallas moved up to the front of the plane. I slid over to the window seat and looked forward to stretching my legs and using the restroom before the plane reloaded. The talking woman and her husband moved up and sat across the aisle from me. They were holding a bottle of champagne. They were the anniversary couple. The elderly woman sitting next to me went to use the restroom. The talking woman and her husband asked if I would watch their things while they went to use the restroom as well. I said, sure, even though I needed to go myself. Surely there would be enough time before the next group of passengers boarded the plane. I kept looking back at the restroom. Unfortunately for me it was a very quick turnover, and the first passengers made their way onto the plane before they returned. The plane began filling up and the three travelers still weren’t back from the restroom. Person after person tried to sit in the aisle seat next to me, until I finally put the elderly woman’s travel bag in the seat. Over and over people asked who was sitting in the seats across the aisle. Again and again I had to explain that the seats were taken, the occupants were in the restroom. It was stressful. I repeatedly got an irritated scowl when I told someone the seats were already taken. People looked at me as if I wasn’t telling the truth, as if I was somehow cheating or breaking the rules. The man behind me laughed and said, “You’ve got a tough job!” How did I get this job anyway??? Finally, the plane was full, and the three passengers came back to claim their seats, oblivious to the stir their empty seats caused. The woman next to me asked why her bag was in her seat, and I patiently explained that I put it there because people kept trying to sit in her seat. She smirked but didn’t thank me. The talking woman and her husband settled in and immediately started up a conversation with the young businessman next to them. He had earlier asked me who was sitting in their seats, and frowned when I told him they were taken, as if it was my fault his business partner couldn’t sit next to him. I never made it to the restroom during the flight. I was too worn out from saving the three seats to squeeze past the two pairs of legs next to me. I was ready to be home. Just before we landed I saw the young businessman looking at the label on the bottle of champagne, discussing it with the talking woman and her husband. I watched them from my seat, thinking what a nice thing it was that the flight attendants had given them a gift for their anniversary. And then, incredulously, I watched as the young businessman stood up and walked off the plane with the bottle of champagne still in hand. I hadn’t expected or wanted that bottle of champagne until it was given away. The young businessman had done nothing other than sit next to the talking woman and her husband–and he walked away with an unearned prize. Which is exactly why I didn’t deserve the bottle of champagne. Instant karma. If I couldn’t do a good deed without the expectation of getting something out of it, especially from someone I found irritating and a bit of a nuisance, then I certainly didn’t deserve to be rewarded. 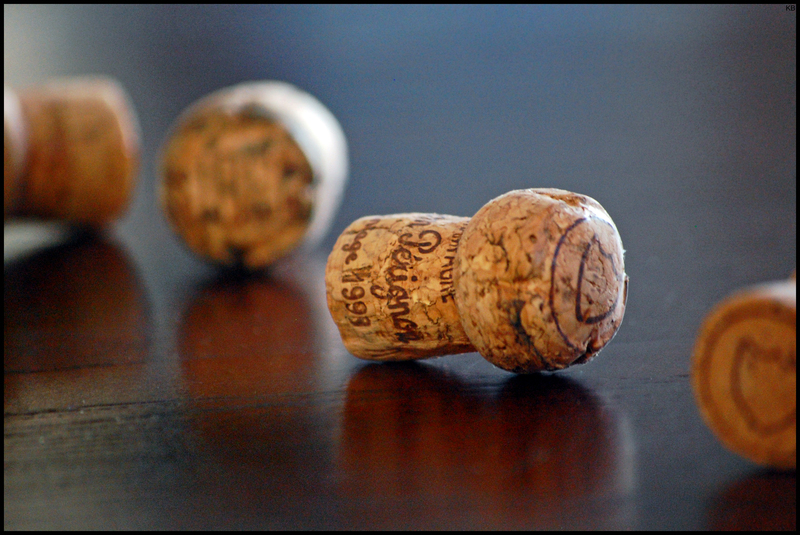 Even if the reward was an expensive bottle of champagne. My last day in Oregon my daughter and I spent an afternoon hiking in the Columbia River Gorge. We stopped off at Multnomah Falls and then did an easy four mile round-trip hike to Punchbowl Falls. Usually I would choose a longer, more challenging hike, but I was still sore from Sunday’s half marathon in Eugene and needed something tame. After two days of rain and temperatures cold enough to keep me curled up on the sofa under a down blanket, the day of our hike was dry and somewhat sunny. I was amazed you could leave your house in Portland, hit the freeway, and be on a secluded forest trail within thirty minutes. The freeway runs right along the Columbia River–the same river that took Lewis and Clark to their final destination, the Pacific Ocean. Even though we were on a major highway the scenery was lush and green, and there were numerous waterfalls cascading off the sides of the gorge. I think we must have seen close to twenty waterfalls the entire day. We made a quick stop at Multnomah Falls. Lovely. After that, it was a very short drive to the Punchbowl Falls trail head. I was surprised that you have to pay to park, but I suppose the trail can get crowded on the weekends being so close to a major city like Portland. On a Wednesday afternoon, we only saw three other people on the trail. I don’t believe I’ve ever seen so many different shades of green in one space. I loved the moss growing on the trees. I have a potted fern on my front porch. It’s always shriveled and dried up. It doesn’t like living in Texas. Now I know why. They grow wild here in Oregon. The trail parallels Eagle Creek the entire way. We saw several of these guys on the path. The forest was so moist and mossy, it must be paradise for a slug. I’m always amazed at how tall the trees are in Oregon. I can only imagine how tall the old growth forest was before the settlers arrived. I was glad I wore my raincoat when the trail took us through a small waterfall. There were many varieties of wildflowers, including the delicate Columbine, which tends to grow on the sides of wet cliffs and along the banks of shady rivers, lakes, and streams. A small spur off the side of the trail leads to Metlako Falls. Apparently it’s been a very rainy spring, even for Oregon, and the waterfalls are extra spectacular this year. After an easy two mile hike, which included some scrambling over a small stream, we reached Punchbowl Falls. I’m sure it’s named as such due to the round basin the waterfall spills into. I know people must jump off the cliffs into the pool because there was a sign warning us not to. After the hike, we drove on part of the old highway along the Columbia River to find Bridal Veil Falls. For some strange reason we found the bridge named after the waterfall, but not the waterfall itself. My specialty is missing what’s right in front of my face, and apparently I’ve passed the trait on to my daughter. We decided to console ourselves with post hike beers at McMenamin’s Edgefield. It was a great way to celebrate a fantastic hike and my last day in Oregon with my truly wonderful daughter. Though I hate that she lives so far away, she’s chosen a great place for me to visit! After running the Eugene Half Marathon, I spent a few days visiting my daughter and her fiance in Portland. Despite the cold, rainy weather, Portland is a city I could definitely learn to love. I did almost no sightseeing in the city itself, mainly because I had just run a half marathon and my legs were a little trashed. And did I mention it was cold and rainy? We’re talking 40’s and 50’s, which is like winter for this Texan. While in Portland, we had dinner one night at a fantastic Thai restaurant called PaaDee on Burnside. It was, hands down, the best Thai food I’ve ever eaten. I loved it so much I even took my friend Hari there for lunch the very next day before he flew back home to Dallas. We even took pictures of our food–it was that good. The only time in my life I’ve ever photographed my food in a restaurant. Hari blissfully eating in all his Eugene paraphernalia. One afternoon my daughter and I walked (I hobbled) up to Mt Tabor. I can’t believe there are such beautiful places in a city the size of Portland. They don’t call me a tree hugger for nothing. One thing I love about Oregon is the incredibly tall trees. They make our Texas trees look like bushes. Right in the middle of the city, next to parking lots, are these huge trees. I almost got rear ended looking at the trees. The tree in a parking lot that nearly caused an accident when I saw it. It seems to be a young city. Maybe it’s because I spent most of my time with my daughter and her friends, but everyone seemed to be young. The houses are fantastic. Historic, full of character, charming. These are houses I could live in. It seems to be trendy to dress like a Victorian. We saw a few guys dressed in bowler hats, bow ties, and old fashioned pants. Interesting. I expected to see a lot of granola types, but this I didn’t expect. The homeless people have cell phones. I saw quite a few walking around town talking and texting on their phones. And there are a lot of homeless people in Portland. The bridges are scary to drive across. I’m not afraid of heights, but driving across the Willamette River on the freeway bridge made me feel like the girl in Clueless who accidentally gets on the freeway. You see a lot of old, beat up cars in Portland. You rarely see old cars in Dallas. People there pride themselves on their new, expensive, immaculately clean cars. I liked seeing the old cars still out there, being put to use. Recycling is serious business, and the city even picks up compostable items. People drive more courteously than they do in Dallas. I never had anyone tailgate, or cut me off, or drive aggressively. Cars and bikes share the roads. The cyclists actually stop at red lights and stop signs. They even wait until the light turns green. Road signs and signals seem to be optional in Dallas (and that goes for cars, as well). Everyone expects changing weather and brief rain showers. They dress in layers and carry umbrellas. But they still talk about the weather all the time. I could work for Nike. The Nike world headquarters in Beaverton is an awesome space. The buildings are surrounded by trees and various running paths, trails, and tracks. Everyone going into the building was dressed very casually in jeans, t-shirts, and running shoes–Nikes, of course. I loved visiting Portland, and could definitely see myself living there one day. Even with all the chilly, rainy days, I suspect I would eventually adjust and learn to layer up. When the temperatures start hitting the 100’s down here in Texas in a few weeks, I’m going to remember there are cooler, more habitable places in America–like Portland. The other night I had a dream about a grizzly bear. Anytime a grizzly bear shows up in my life, even if it’s merely a dream, I sit up and take notice. A few weeks ago I read a blog post about grizzlies, and this morning Michael sent me a link to an article about a woman who survived a grizzly attack. The power of the grizzly beckons and wants to be noticed. One of my favorite blogs is Off the Beaten Path: Hikes, Backpacks, and Travels. The author is living the life I’ve always wanted to live. She writes about living in Montana and of the travels and sights her and her husband have seen, mostly out west. Michael and I have talked very seriously about selling our house, buying an RV, and traveling the western parks. If I had my choice, I’d settle down somewhere in Montana or Wyoming in my little RV and never look back. Off the Beaten Path wrote a great post a few weeks ago about backpacking in grizzly country and her fear of a seeing a grizzly. It reminded me of my own grizzly encounter in Yellowstone. Shortly after I met Michael four years ago, I mentioned to him that I was driving up to Yellowstone in a month. My daughter, a geologist who lived in Jackson Hole at the time, was flying down to visit us in Texas and we would make a mother-daughter road trip back up to Wyoming. I don’t know what possessed me, but I boldly told Michael he should fly up and see Yellowstone with me, that it would change his life. I met him at the Jackson Airport a month later. While we were in Yellowstone, towards the end of our stay, we wanted to take an all day hike off the main tourist trails. We chose a trail in the vicinity of West Thumb and Yellowstone Lake and drove over from our campground. When we gathered our gear and walked up to the trail head, however, we were stopped by a sign stating the trail was closed due to “bear activity in the area,” but that it would open up the very next day. Michael assured me that hiking one day early would be okay. I hesitated. My daughter had been a park ranger in Yellowstone for several summers before she found full-time work in Jackson Hole. I had heard many stories of dumb tourists and their disregard of the park rules–sometimes with deadly consequences. I had also been a teacher for many years and following the rules was ingrained in my psyche. I had a really bad feeling about going on that trail. Other than my guilt at not following the rules, it just didn’t feel right. I felt very, very strongly that we shouldn’t take that hike. I told Michael I wanted to use the restroom before starting off, and headed over to the port-a-let. It was mostly just an excuse to buy myself some time. I came out and told him I didn’t want to hike the trail, that maybe we could find another one, apologizing for my timidity and trying to explain my hesitation. We got back in the car and turned around to reverse. Just as we started to back up, a grizzly came sauntering out of the trees, not ten feet from the car. Even in the car, I was scared. I’ve seen quite a few grizzlies from a distance, but never one even remotely this close. They are massive, with long claws–and despite their size, they’re fast. I was glad we had the protection of the car, but kept the motor running and the car in drive. The grizzly ignored us as she went about eating vegetation in the parking lot. We were the only ones there, and felt honored to be able to be so close to such an impressive animal. We sat and watched her for a long time, and Michael took a ton of photos. This experience only reinforced the certainty for me that I never want to see a grizzly on a hike, up close and personal. I’ve been on several hikes in the past where people have passed us on the trail and excitedly asked: Did you see the bear?!? My answer has always been the same: No, and I don’t want to see the bear! I was so glad I listened to my intuition and we hadn’t gone on that trail. We drove a ways and found another perfect hike to the top of Sepulcher Mountain–and we didn’t see a bear all day.